Eco operation for saving electric power cost! The granulator cuts runners with very little dust. No more wasting the materials! The equipped inverter controls the motor output to the optimum level. 28% energy saving! Automatic idling saves about 60% electric power. 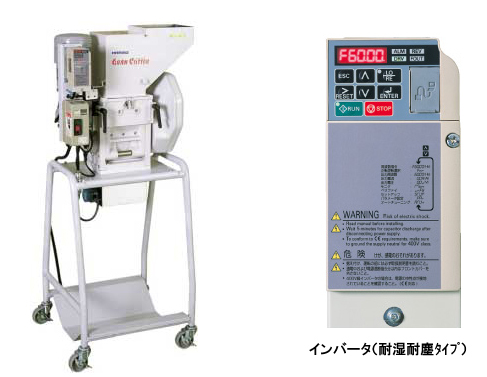 Far more economical granulators with the following features. If the granulator has a mis-cut, the machine rotates the blades in reverse direction. The reversed rotation consists, the machine alerts you with the buzzer. The run speed is adjustable. For example, when the granulator runs at 60Hz in a 50Hz area, throughput will be 20% improved. The longer the machine is idled, the longer the motor service life will be. Use an external device (ie: an emergency stop switch, an area sensor or a metal detector) on the granulator to enable emergency stop. * As small or soft runners have little effect on load fluctuation, the machine may not recover from idling. In this case, use the ON/OFF switch to enable the normal operation. Use the equipped switch accordingly with the runners. * The specification and the dimensional diagram for this model conform with the standard grancutter and mixer.